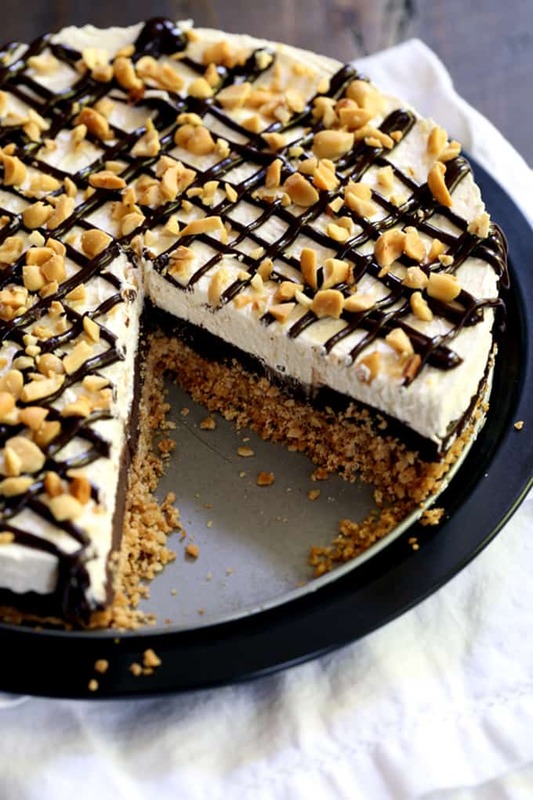 My Almost No Bake Drumstick cheesecake is a delicious take on a childhood favorite. A waffle cone crust is layered with chocolate ganache and no bake cheesecake before being drizzled with even more chocolate and chopped peanuts. If there’s one warm weather treat that I’ve loved since childhood, it’s an ice cream drumstick. It seems I’ve also passed this love along to my children as well for they love to see them stocked in our freezer as a special after dinner treat. Ice cream, nuts, chocolate, a cone… it has everything you’d ever want in a sweet treat. Minus the melting. Sweltering heat and ice cream just don’t seem to get along. To combat this first world problem, I’ve created a new dessert as an ode to my old favorite, Almost No Bake Drumstick Cheesecake. No melting treats are occurring on my watch! Almost no bake, you say? Sure, I could’ve fibbed a bit and said this was a completely no bake dessert, but the waffle cone crust does need a quick 10 minute trip to the oven to set up. And really, what’s 10 minutes in the oven for a crust made of waffle cones? Every other component of this delicious dessert is absolutely no bake though. Scout’s honor. My Almost No Bake Drumstick cheesecake is created with the same layers as an ice cream drumstick. 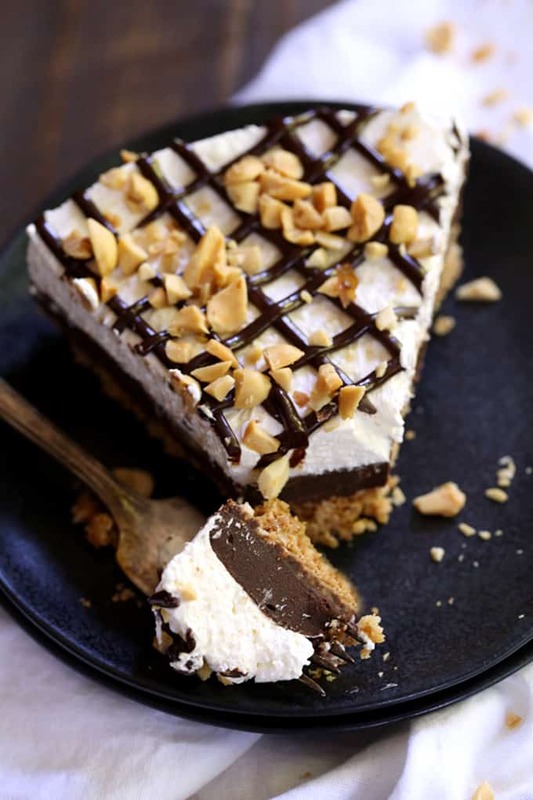 A waffle cone crust is layered with chocolate ganache and no bake cheesecake before being drizzled with even more ganache and chopped peanuts. You know the chocolate that awaits you when eating the last bite of a traditional drumstick in the point of the cone? Sure you do, it’s the best part! That’s why I made sure that my chocolate ganache layer was just as thick as the no bake cheesecake layer. No need to skimp on the good stuff, I say! I guarantee you that my Almost No Bake Drumstick Cheesecake is going to be your go-to dessert of choice this summer. Perfect for cookouts, get togethers or just when it’s so darn hot outside you just want to sit in the air conditioning on the sofa and enjoy a cool treat that took just minutes to create. Yes. Especially that last one. 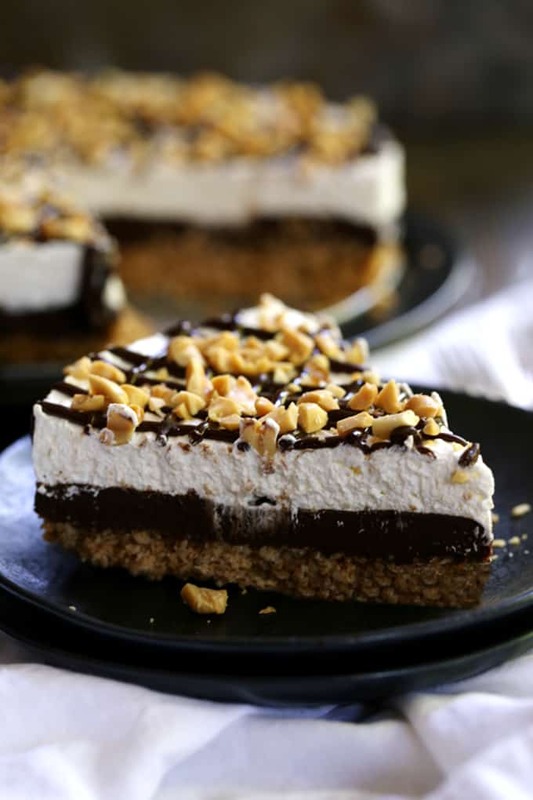 If you’re a card carrying member of the no bake dessert fan club – and really, who isn’t? 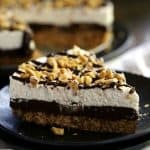 – I have no doubt you’ll fall head over heels with my insanely popular Black Forest No Bake Cheesecake, my decadent Double Chocolate No Bake S’mores Pie and my super easy Double Chocolate Eclair Cake. In the bowl of a food processor, add waffle cones and pulse until they resemble coarse crumbs. Pour crumbs into a medium bowl and stir in sugar and melted butter. In a greased 9" springform pan, pat crumbs into a single layer using the bottom a measuring cup. In a microwave safe bowl, add heavy cream and chocolate chips. Microwave for 70 seconds and then whisk until smooth. Pour into an even layer over waffle cone crust, reserving 1/2 cup for topping, and refrigerate until set. In a medium bowl, mix together cream cheese, whipped topping and powdered sugar with an electric mixer until smooth and just combined. Spread evenly over chocolate ganache. Refrigerate for at least two hours or until set. Remove cheesecake from springform pan. 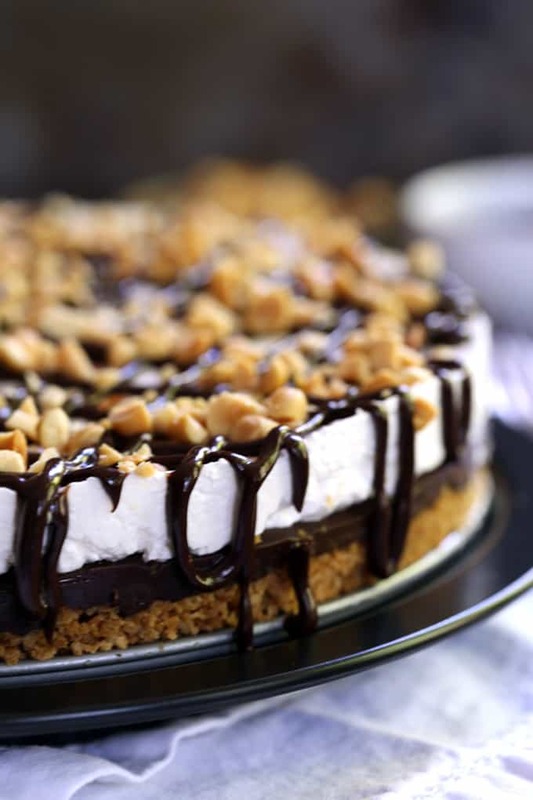 Drizzle remaining chocolate ganache over top of cheesecake and sprinkle with chopped peanuts. If you still haven’t reached your no bake dessert quota, I have friends with additional recipes at the ready. These candy filled No Bake Monster Cookie Bars caught my eye, as well as these No Bake Snickers Crunch Bars. And of course, these No-Bake Chocolate Peanut Butter Coconut Bites are sure to banish any chocolate craving you might be experiencing. Drumsticks are one of my favorites! Can't wait to try t his! Would this be okay to have for breakfast?! It looks amazing! I wish I had a slice of this cheesecake right now! It looks amazing! I can totally use a few slices of that! This looks ah-mazing!!! I think this is going to be my new summer treat! This looks like one EPIC dessert! This looks AMAZING!! And you didn't skimp on my favorite part... The chocolate! I want to make this for a family reunion in August. Can it be frozen, or should I make it the day before? Hi, Shay - I'm thinking making it the day before would be the best bet. I haven't tried freezing it but thinking the cheesecake layer might not endure freezing as well. Let me know what you think! My guys love drumsticks - they would go crazy for this! Thanks for including me! You bet, Erin - happy to do so! Just made this for dessert for Christmas Eve and it was a huge hit! I even used 1/3 less fat cream cheese and lite cool whip and it was amazing! Loved it!!!! So glad you enjoyed it, Lauren - thanks so much for taking the time to let me know! Merry Christmas! This sounds SO good! What a great dessert to make when we have guests! How long does the cheesecake have to set up? Hi, Mary - It's usually good to go in just a couple of hours. My husband does not like chocolate. I often substitute caramel in recipes for him. Do you have any recommendations what would work well for a caramel ganache Layer to make it thick enough? Hi, Lauren - I haven't tested this recipe using caramel so I can't say for certain. You'd need to find something that would stay thickened to insure that your cheesecake would hold together. I can't even handle how good this looks! You're so kind, Juliann - thank you! I love drumsticks! They're probably one of my favorite store bought ice creams to have in the freezer. Oh my and it looks like I'd love this cheesecake just as much!! That looks amazing....love that thick crust. I bet it is fab with the cheesecake! Hi, Rikke - Whipped topping is a stabilized version of whipped cream that is found in the frozen food aisle at the grocery store. A common band name in the US is Cool Whip. Be still my heart! This cheesecake HAS to happen! I absolutely agree it does, Trish! Ooooooh this is fabulous! I would love a slice right now! Still consider this a no-bake dessert! And what a dessert it is! 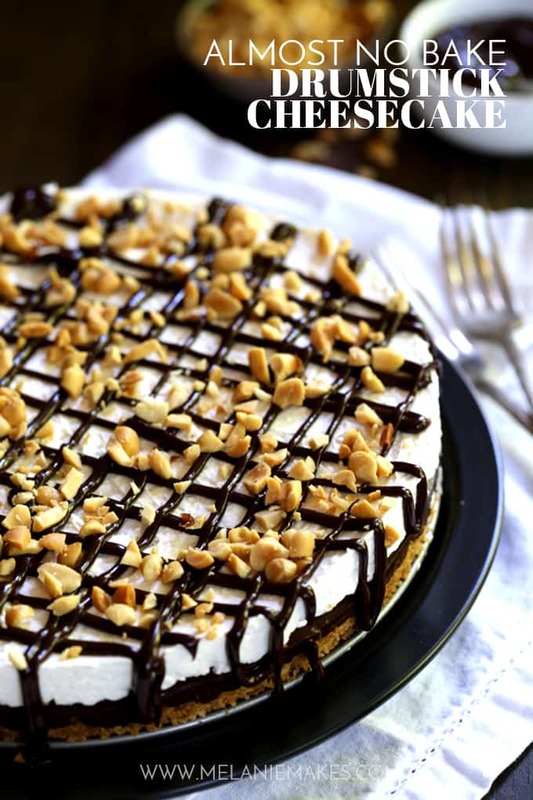 I always bake cheesecakes, but I need to try the no-bake method because this looks fantastic! I do to, Kacey! So much easier than a traditional cheesecake! You had me at drumstick! What a fabulous and heavenly recipe! You're so kind, Sheena - thank you! OMG! I freakin love this recipe. I will definitely be making this. You totally made my day, Kara - thank you! Let me know what you think when you give it a try!